© 400tmax/Getty Images A passenger tunnel between two terminals under the air field at Chicago O'Hare Airport. 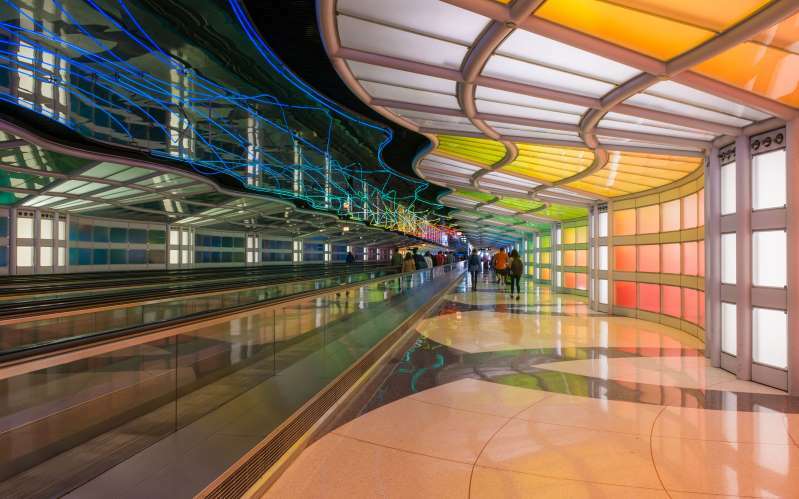 When it comes to major airports in the U.S., one city stands out from the rest. Chicago will soon be the only city in the U.S. to offer nonstop flights to six continents (all but Antarctica) when Air New Zealand begins service from O'Hare to Auckland on November 30. Chicago will then join the ranks of just four other cities — London, Johannesburg, Doha, and Dubai — that can make this claim, Susan Kurland, deputy commissioner for air service development for both O'Hare and Midway airports, told Travel + Leisure. From these five cities, travelers can book nonstop flights to Africa, Europe, North America, South America, Asia, and Australia/Oceania. That just leaves Antarctica. Launching long-haul flights to Antarctica has been a challenge for airlines considering the area's smaller population and limited resources like fuel, vice president of air policy for Airports Council International—North America Matthew Cornelius, told Travel + Leisure. Several U.S. airports offer flights to five of the major continents, excluding either Australia or Africa, either because of logistical challenges or a lack of demand, according to Cornelius. Newark Liberty International Airport (EWR), Washington Dulles International Airport, Logan International Airport (BOS), Hartsfield-Jackson Atlanta International Airport (ATL), and John F. Kennedy International Airport provide service to all the major continents except Australia. George Bush Intercontinental Airport, Los Angeles International Airport, and Dallas/Forth Worth International Airport offer nonstop service to all the major continents except Africa. Chicago's O’Hare, dubbed America's best-connected airport by air travel intelligence company OAG in 2017, is the only airport in the U.S. currently to have dual hub operations from two of the country’s major carriers — United and American — and Southwest Airlines’ largest operation in the U.S. is at Midway Airport, according to Kurland. The airport is in the midst of an $8.7-billion expansion plan, considered one of the largest construction projects in Chicago's history, that will add new passenger terminals, air traffic control centers, runways, and parking structures.